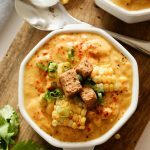 Inside Scoop: This is hands down the best dairy-free creamy chicken and corn soup you’ll ever have! This recipe was submitted by Pam Eike, Certified Holistic Nutritional Consultant and Culinary Nutrition Expert. We don’t really think that soups should be reserved primarily for winter or colder months. Especially when it comes to corn. Corn is really a seasonal food, with the end of the summer being its most flavourful time of the year. But that’s just it, corn is really a summer food, isn’t it? 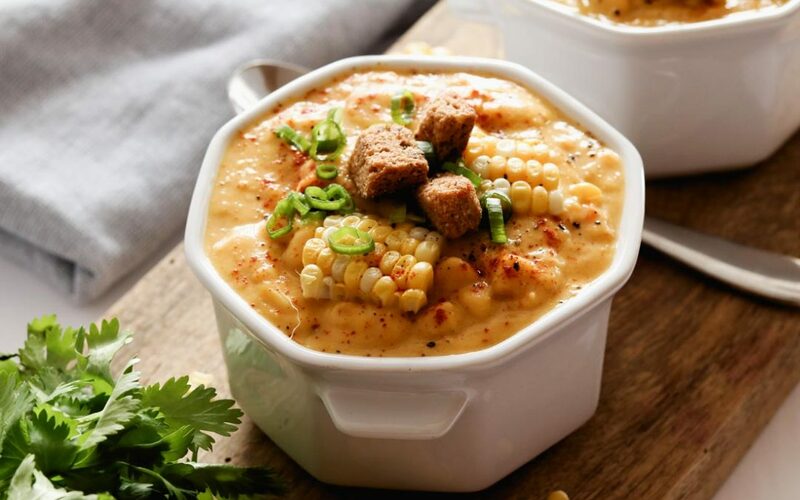 Grilled corn on the BBQ, corn salads and salsas, and then you have this easy and light Creamy Chicken And Corn Soup – it’s a chowder, a soup, made with healthy ingredients, whole foods, is incredibly simple to put together and is oh so unbelievably delicious. 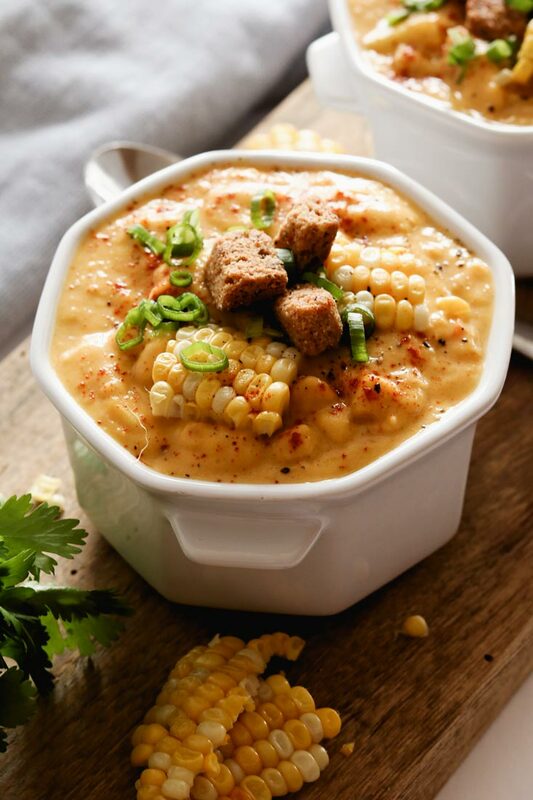 This Creamy Chicken And Corn Soup is the perfect all-season food! You don’t need to eat it piping hot, it’s still light, refreshing, and yet filling and heavy enough that you don’t need too much to feel satisfied. Check out our Smoky & Sweet Zucchini & Corn Fritters, another summer corn favourite! 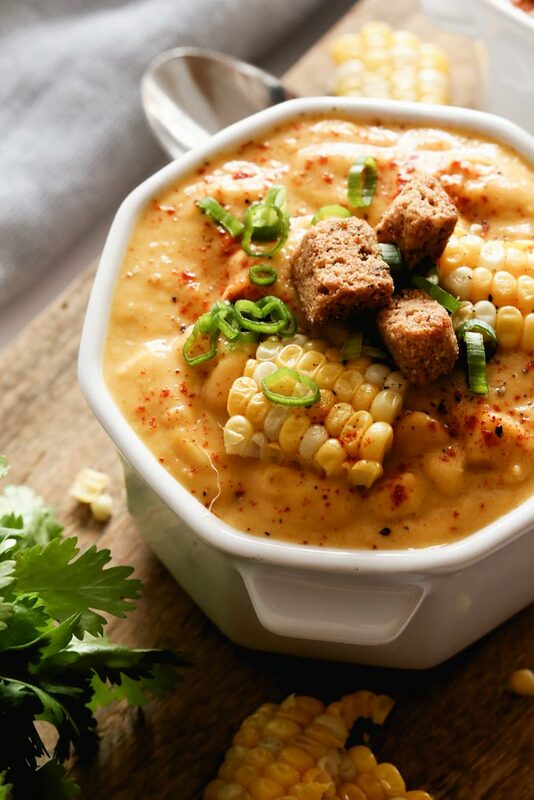 Have you tried dairy free chowders yet? Let us know in the comments below what your thoughts are. 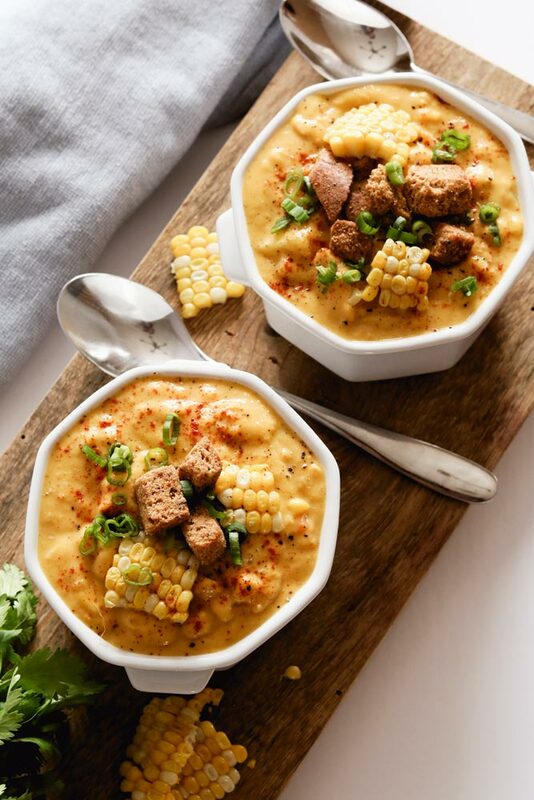 This creamy chicken and corn soup is the perfect dairy and gluten-free, all-season chowder that is sure to hit the spot every single time. *If you don't have smoked paprika use regular & a drop of smoke flavour. Heat coconut oil in large pan over medium heat. Add chicken, cook to brown, remove chicken and set aside. Add onion, cook until soft, then add garlic, celery, potatoes and carrots. Add corn kernels, paprika, a pinch of salt, black pepper. Cook until potatoes are slightly soft, then add apple cider vinegar, vegetable broth and coconut milk. Cover and simmer until potatoes & carrots are tender (about 15-20 minutes). For thicker soup only: Take a quarter to half of the soup and blend it, or hand blend for a couple minutes. You don't have to do this, but we find it creates a creamier taste. Cut or shred the chicken up and add back into the soup last, taste and adjust seasoning. Serve with chopped parsley or chives. 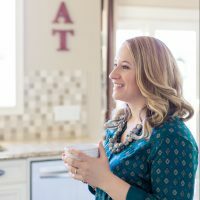 Pam grew up on a hobby farm just outside of Victoria, BC, and moved to Calgary in 2004, her appreciation for food and health grew from there.